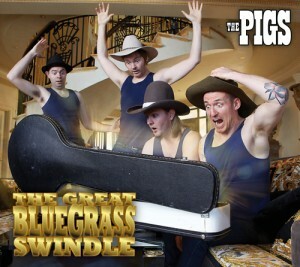 The Pigs are set to release their long-awaited new album The Great Bluegrass Swindle at Notes Live on 5th Oct, 2012 from 7:30pm, and they you to join them. The band tells us that The Great Bluegrass Swindle is a fast and furious tractor ride that hints at the uniquely bent energy of The Pigs’ exceedingly popular live shows. The Pigs have long been famed for their foot-stomping version of Beyonce’s “Single Ladies”, that video popping up on Spicks n Specks and as “Indie Video of the Week” on ABC’s Rage. Most recently The Pigs played a quirky live version of “Single Ladies” on Australia’s Got Talent. The band then returned to the show to perform a wildly original, countrified version of Kanye West’s Gold Digger. The Pigs are not just known worldwide for their crazy interpretations of other people’s songs. For 8 years now they have been wowing audiences at venues & festivals around Australia with their infectious original tunes, like the super catchy, “Hey Christina” (some say the greatest break up song ever! ), and the anthemic and hilarious “Macho Moisturiser”. The new album contains more classic original tunes like “She Wants Your Kidney” and “Poor Emily”. Recorded over 10 banjo filled days, by legendary producer ‘The Pigs’ Ear’, ‘The Great Bluegrass Swindle‘ combines six original tunes with songs the band has made their own – with definitive versions of Kanye West’s “Gold Digger”, LMFAO’s “Party Rock Anthem” and the 80’s classic “Just Cant Get Enough” and more. ‘The Great Bluegrass Swindle‘ is available now through iTunes and MGM/Green Distribution.